A blind musician falls in love with a kindhearted girl. This love begin to confront with his disease and with his music. A young love fights against the stupidity and boredom of society. A suicidal factory girl out of reformatory school, anxious to escape her overbearing mother, falls in love with a sailor who can't forgive her past. A film director tries to create the best film in history, but finds out that human abilities have their limits. A sailor returns to his hometown after 7 years and remembered the dark and the light moments of his past. A needy couple in a bad marriage travel back to Stockholm after a trip to Italy. Meanwhile, a widow resists seductions from two different persons - her psychiatrist and a lesbian friend. A small-town piano teacher is shocked by the arrival of her foster daughter's real mother, whose young lover soon follows and causes further disruption. A story of two refugees - wife and husband - from the dictatorship. Their quiet life in a new free country is impossible because of the husband's dark secret. Two different women - a young photo model and her boss - dreams about a happy life with beloved men. Their dreams are as different as they are. After a 15-year marriage, the spouses are going to divorce, but suddenly find out that their feelings have not vanishing yet. From the World's Master Film Maker Ingmar Bergman a startling journey into the darkness of the human soul! 'Music in Darkness' is early Bergman, his fourth as a director. 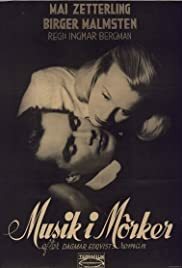 Early Bergman is actually same expression like Early Kurosawa or Early Hitchcock - usually well made (far from being amateurish), but shallow in plot and void of depth in characters and dialogue. 'Music in Darkness' is exactly like that. Beautiful cinematography, but no other Bergman traits. If one wouldn't know it's a Bergman movie then they would think it's just OK melodrama about blind musician and his struggles with life and love. Pretty predictable and by the numbers drama that actually follows more classical Hollywood formulas than carries Bergman's voice (I guess that's the reason this is called Early Bergman). The subject of depression and human's inner fights are only touched on the surface. By far from being a bad movie, but nothing too memorable also. Competently directed little film.